From the reception area to the exam room, our team of proactive caregivers and pet lovers works together to create a warm and welcoming experience for both you and your pet. Our goal is to work as a team, to provide our services in a clean, safe, friendly and professional environment for all patients, clients, and staff members. We will strive to meet both the needs of individual clients and patients, as well as to contribute to the well-being and improvement of our community. Dr. Madeline “Maddie” Scofield was born and raised in Odessa, Texas. She attended Texas Tech Univ. for an undergraduate degree in Zoology and earned her DVM from Oklahoma State Univ. in 2010. Dr. Scofield worked in Colorado and Wyoming, where she received certification in veterinary acupuncture from Colorado State Univ. prior to moving to the Eastern Shore with her husband Dr. David Scofield in 2012. She enjoys all areas of small animal practice, but feels special satisfaction in treating senior patients using alternative treatments and hospice as well as performing soft tissue surgery, and building lasting relationships with clients and their pets. Dr. Scofield grew up with gun dogs and enjoys watching any sporting breed in action on the Eastern Shore. When not working, she enjoys trail walking with her dogs and baby, outdoor sports, fishing, cooking, gardening, and traveling with her family. Dr. Scott Hemenway graduated from Ross University School of Veterinary Medicine in St. Kitts after attaining his undergraduate degree in Animal Bioscience from Penn State and a master’s degree in Parasitology from the University of Maryland. Dr. Hemenway grew up primarily in Pennsylvania, working with his grandfather, a mixed animal veterinarian, from the young age of four years old. After graduating veterinary school, Dr. Hemenway worked primarily in a large animal practice near Buffalo, New York. He then moved back to Pennsylvania to transition to a small animal practice. In 2004 Dr. Hemenway settled in Florida and, in 2006, purchased his own small animal practice with another veterinarian. Dr. Hemenway started with Chestertown Animal Hospital in October 2017, with a primary interest in small animal internal medicine and ultrasonography. While he considers himself a dog person, he has two cats and two exotic birds, Mango and the Macaw and Kookie the African Grey. His animal clan still lives in FLorida with his 19 year old son Dane. When Dr. Hemenway is not working you can find him in the great outdoors either on his motorcycle or hiking. He also happens to be an incredible cook (just as our staff!). Dr. Kathleen (Katie) Stevens graduated from the University of Pennsylvania School of Veterinary Medicine with a focus in mixed animal medicine. She was born in California, but with a father in the military, moved to many different states before her family finally settled in Northern Virginia. She graduated from the University of Virginia with a degree in both Biology and Psychology before going straight to veterinary school in Philadelphia, PA. Following graduation, she completed a one year internship in Farm Animal Medicine and Surgery at NC State Veterinary Hospital in Raleigh, NC to obtain more experience working with large animals. Dr. Stevens started working at Chestertown Animal Hospital in August 2017, working both in the small animal hospital and on the road treating large animal patients. She lives in Chestertown with her adorable pitbull/box mix Lennie and her two cats, Gemma and Samson, all adopted during her time in veterinary school in Philadelphia. When not at work you may see her running around the neighborhood or hiking with her dog! She hopes to one day have a farm of her own while somehow finding time to travel and see as much of the world as possible. Marlene grew up in Millersburg PA and moved to Chestertown in 1978. She now lives in Dover with her husband Kenny. Marlene has worked with us since 1986 as a receptionist and is now the manager of our front office. She has one son, Adrian, and several grand-dachshunds along with her Boston Terrier, Spanky! Marlene enjoys hiking with her dog, Zumba, gardening and shares a mutual interest of classic cars and motorcycles with her husband. Sherry has been with our hospital since 1988, starting as a veterinary technician before moving to the front office staff where she has been the past 15 years! Sherry also handles all of our large animal specific receptionist duties. Sherry was born and raised in Rock Hall, and lives there now with her boyfriend of 23 years, Wayne Wilson. They have two dogs, Star and Gunner and adopted our hospital cat, Hannah, a few years ago. In her spare time she loves spending time with her grandkids. Lori started with Chestertown Animal Hospital as a technician after graduating a veterinary assistant program in 1997. As well the inventory manager, Lori is also a mother of two daughters as well as six chihuahuas, two cats, a turtle and two ponds full of fish! Outside of work she also enjoys riding her motorcycle, gardening, going to the beach and spending time with her grandkids and family. Jan is a retired special education teacher and has been with Chestertown Animal Hospital since Feb. 2017. She was born and raised in suburban Philadelphia, and has lived in Rock Hall for over 40 years, where she and her husband raised their two sons. They have an older black lab, Lucy, and a younger lab/chessie mix, Leila. Jan also enjoys the outdoors and working part-time. Robert was born and raised in Chestertown and has been with our hospital since August 2017. He graduated from Queen Anne’s County High School and started classes at Chesapeake College in liberal arts before joining our staff. Robert enjoys exotic pets and has 2 corn snakes, Rorschach and Kami. His hobbies include drawing and enjoying new books. His goal is to eventually work in animal rehabilitation or a sanctuary environment, to continue furthering his love of animals! 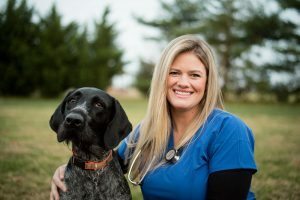 Taylor has been with Chestertown Animal Hospital since 2016. She grew up in both Delaware and California, before eventually graduating from Kent County High School. She now lives in Chestertown with her husband, Sam and their black Labrador Retriever, Bo. When not at work Taylor enjoys photography, helping feed the cows, and decorating the nursery for their newest addition! She is excited to start their family with their daughter and enjoy life on the farm. Sara has been with Chestertown Animal Hospital for two years working both as an assistant and kennel attendant. She just graduated from St. George’s Technical High School and will be attending the University of Delaware with the hopes of going to veterinary school at the University of Pennsylvania one day! Her dream is to be a mixed animal veterinarian. Sara’s hobbies include riding her horses, hunting, fishing and spending time on her farm with her horses and dogs. Courtney has been with Chestertown Animal Hospital since October 2017. She graduated from Queen Anne’s County High School and had lived in Chestertown her whole life. She now lives in Crumpton with her family and her sweet black lab puppy Ellie. She enjoys spending as much of her free time as possible with her dog, friends and family and always has a smile on her face! Kalvin joined our staff in September of 2017 after completing a veterinary assistant training program at Chesapeake College. He was born and raised in Church Hill, MD and graduated from Queen Anne’s County High School. He eventually wants to obtain an Associate’s degree from Chesapeake College and maybe go to veterinary school one day! When not at work Kalvin enjoys photography, working on old cars and spending time with his 3 chihuahuas, 1 poodle, and 2 cats. Jess was born and raised in Centreville and currently lives with her family in Church Hill. After graduating Queen Anne’s County High School she completed a Veterinary Assistant course at Chesapeake College. Jess had worked at two different small animal hospitals as a technician before joining our CAH family in October 2017. Jess has 2 cats, 2 dogs and recently rescued an adorable litter of 3 brand new kittens! In her free time Jess enjoys photography, hiking and traveling and has a special love of old horror movies. Jess hopes to eventually obtain her veterinary technician license and specialize in exotic animals. Destiny was born in Glen Burnie and grew up in Sudlersville. She started with Chestertown Animal Hospital in November of 2016. Destiny enjoys reading, kayaking and hiking with her cat Lilly and hopes to visit as many countries on other continents as she can! Janae graduated from northern Virginia Community College in 2000 with an Associates degree in Veterinary Technology. She is from Northern Virginia but has spent time in San Diego and on the western shore. When her family moved to the eastern shore in 2010, her husband and her fell in love with the small town feel. She spent 15 years in emergency medicine and specialty practice. Her passion is emergency medicine and surgery. She spends her spare time with her husband, 3 daughters and small Chihuahua named Chaos.